How to Play: a basic tutorial for TTFO rules! If you are new here and/or have some doubts about how the rules work, this tutorial is for you! I'm trying to make it easy to everybody understand, with some images and all. We will start with the rules: Same, Plus and Same Wall. PS: The rules in some images are in portuguese what is my mother idiom, so sorry for I just realize it after everything was done. 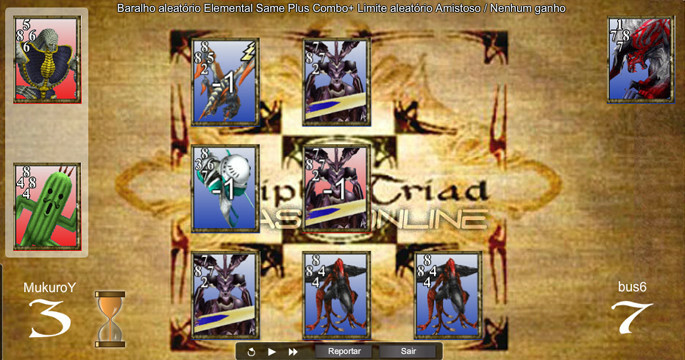 How to Play: a basic tutorial to understand the TT Rules and TTFO Special Rules! With this rule activated, if your card's strength is equal to at least 2 adjacent cards (at least one of those being an opponent’s card), you'll flip those cards. What does the Same rule do? Look at the example board. The blue Imp’s value to the right is 7, which is the same value as the red Jelleye has to the left. Normally you wouldn’t be able to take that Jelleye with the Imp, since the values are the same. BUT!... 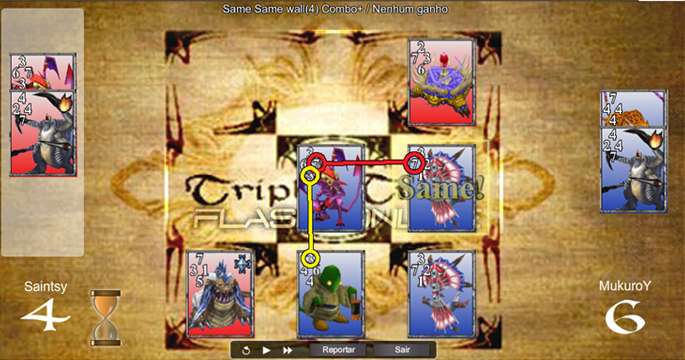 Since we have the Same rule active in this board, also look at the blue Tonberry. It has a 3 on top and the red Imp has a 3 on the bottom; it is exactly what we need to make Same work and flip the red Jelleye. See the picture below; 7 = 7 and 3 = 3! With this rule, if you play a card which strengths add up to the same value on two or more adjacent cards of the opponent, you'll flip the cards. How does the Plus rule work? I hope you haven’t skipped your math class! Plus works by adding card values that are adjacent to eachother. Look at the board below. Normally, the Blue player wouldn’t have a card here that’s strong enough to flip the red Gesper. In this case, though, the Plus rule is activated. This means the Blue player can flip the red Gesper with a card weaker than it, in this case the blue Gesper; this card has a value of 1 to the left, and added to the right side value (5) of the red Gesper it amounts to a value of 6; this is equal the sum of the blue Cockatrice’s top value (2) and the blue Gesper’s bottom value (4). In short, 1 + 5 = 2 + 4 = 6! In this way you can flip an opponent’s card by “plussing” it. The image below clearly shows how this is put into work. With this rule the borders of the grid can help you trigger the 'Same' effect. 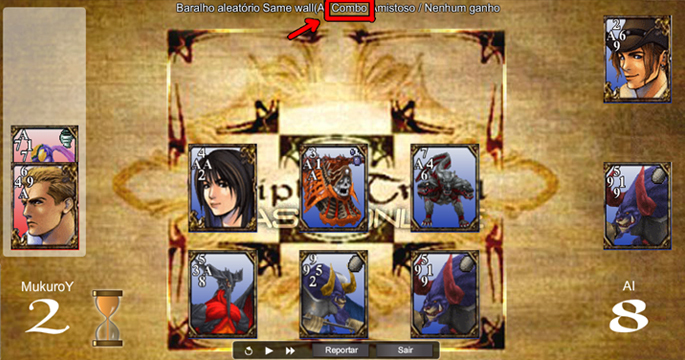 In FF8 borders had a strength of 10 (A), in TTFO you can choose! 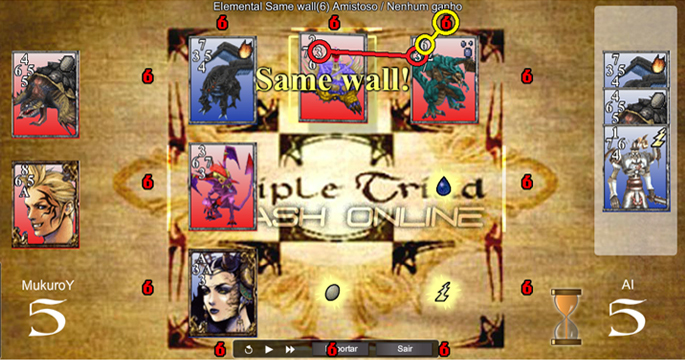 When Same Wall is actived, the borders of the board will assume a value between 1 and A. The Wall value will be indicated as a number in parenthesis, in this example Same Wall (6). If you place a card next to, above or below an opponent’s card and the adjacent values of the two cards are equal WHILE at the same time the value that is adjacent to the Wall is equal to the Wall value, you will flip the opponent’s card. To get an idea of how Same Wall works, turn to the example below. 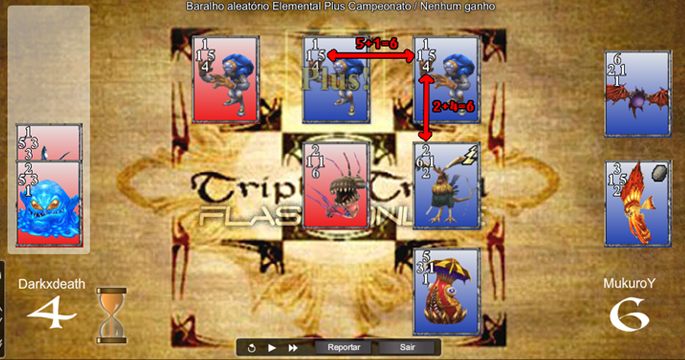 Using the border, the Red player can flip the blue Turtapod using his Blue Dragon; the 3 of red’s Blue Dragon is adjacent to the 3 of the blue Turtapod, and red Blue Dragon’s 6 is adjacent to (the top) of the Wall which, in this case, has a value of 6. You can choose what values the borders will assume in the rule selection window when you are challenging another player or AI (see example below). Last edited by MukuroY on Mon Jan 19, 2015 5:26 am, edited 2 times in total. Re: How to Play: a basic tutorial for TTFO rules! 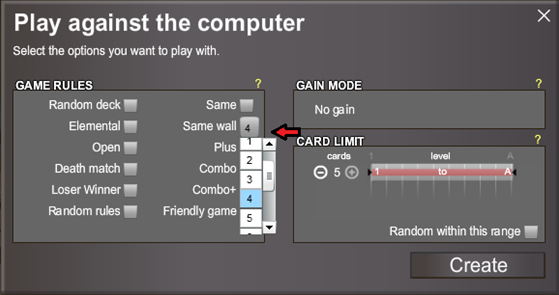 Using this rule every time you flip a card with Same or Plus or Same Wall, it will be considered as if it was just played, and so it'll flip the adjacent opponent cards it beats again. 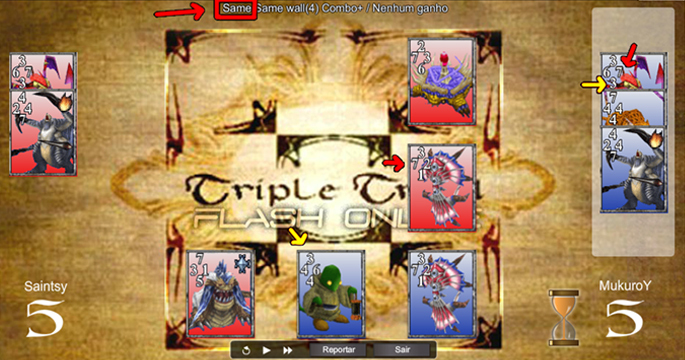 Combo might occur when you use Plus, Same or Same Wall to flip cards. 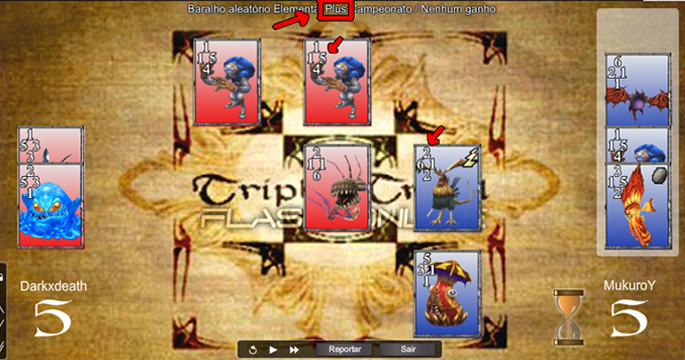 Look at the board in example (note the Combo rule). 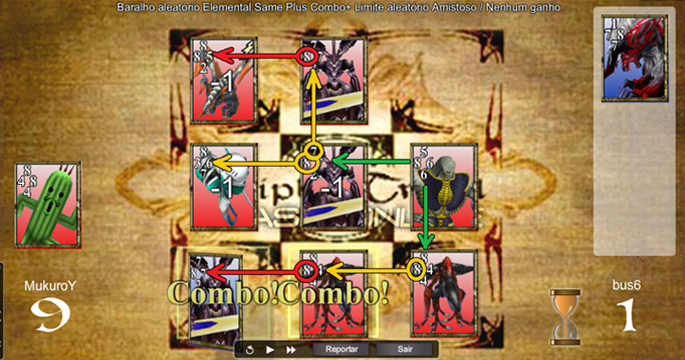 Using the rule Same Wall (A), Red can use Pandemona to flip the blue Cerberus. With Combo working, the Cerberus that was flipped can flip the adjacent weaker cards (Cerberus’s A against Doomtrain’s 1 and Cerberus’s 6 against Sacred’s 5). Executes Combo as long as it is possible! Combo + is an extension of Combo rule, and it works on all opponent cards that can be flipped by the previous card flipped. 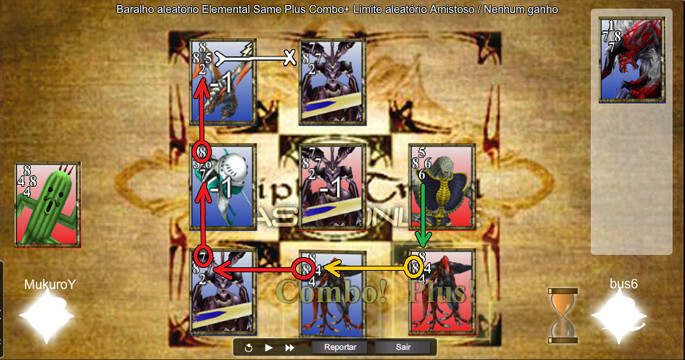 In the example the rule Plus is activated and the Red player can use Gargantua (8 to the left and 6 to the bottom) to flip Ultima Weapon (which has a 6 to the right because of a -1 elemental penalty!!!) and Propagator (8 to the top) by plussing them. Then the Combo starts flipping any weaker cards adjacent to Ultima Weapon and Propagator (another Ultima Weapon, a Propagator and the Mobile Type 8). 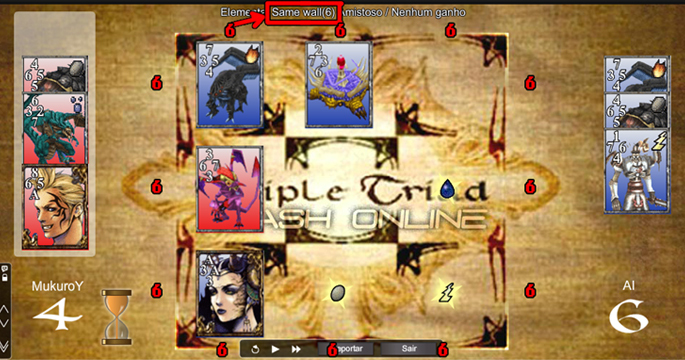 In this example we used the Elemental rule, what I haven't shown in this tutorial because its description in the "How to Play" tab of TTFO is very clear. But you can see it working by the -1 over the cards, what means the values of the card suffer a penalty in -1. When the card have the same element than the spot in the board where it is played, it will receive a +1, adding +1 in its values. Easy, right? Looking at the examples to Combo+ I’ve noticed it may remain some doubts. So I have here a new example, just edited by the last one. 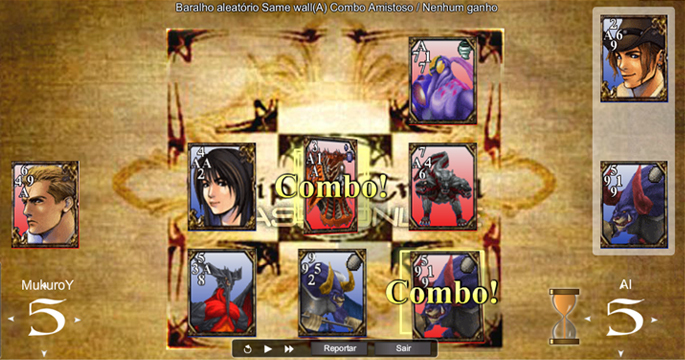 Think about this scenary where the center card, Ultima Weapon, is a red card. When the Red Player play its Gargantua, the Plus will flip only Propagator, making the Combo work from there. Then Combo will flip the next Propagator and Combo+ start flipping the next blue card, what will flip the next weaker until it stop in a stronger one. 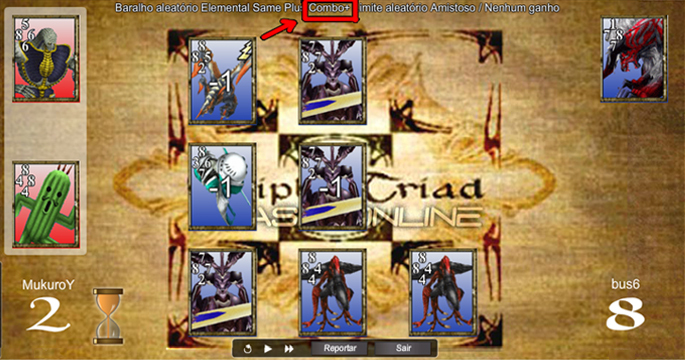 Here it mean the top Ultima Weapon will not be flipped because Tri Point's 4 (5-1 by the Elemental penalty) can’t beat Ultima Weapon’s 8 side. 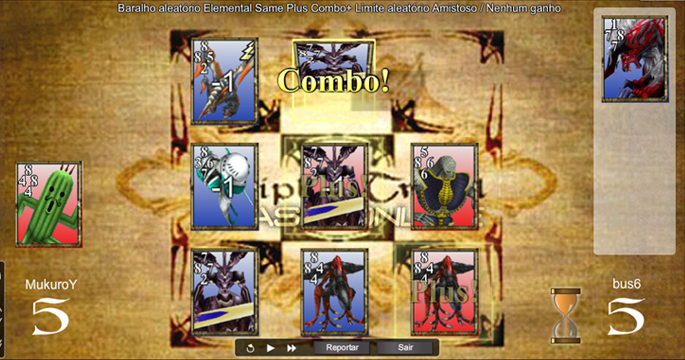 You can notice the center Ultima Weapon don’t flipped no one card by Combo, because it was already a Red Player’s card and wasn’t flipped with Plus. Last edited by MukuroY on Thu Jan 22, 2015 8:39 pm, edited 4 times in total. Excellent work Muk! I also think this should be an official guide, imho included in the How to Play on the main website menu.